Slim Weight Patch (now called Slim Diet Patch) claims to offer a revolutionary and easy to use approach to weight loss in the form of a patch which you simply stick on your skin. The patches use proven Trans-dermal technology, meaning the fat fighting ingredients in the patch are absorbed through the skin into the bloodstream. Sounds very sci-fi but they work in the same way as nicotine patches, which are extremely effective and familiar to us all. They retail at £29.00 per box of 30 patches, which is a month supply as you only need to apply one patch a day. However, there are some good deals available on the order page when you buy multiple boxes. Claims: To harness the latest trans-dermal technology and be the most convenient slimming aid, an effective fat burner, metabolism booster and appetite suppressor. Positives: Incredibly convenient as you just stick one on your skin. More of the powerful nutrients are absorbed as it uses trans dermal tech and avoids the inefficient and wasteful digestive system. Negatives: Due to the Iodine content of these patches, they might not be for you if you suffer from an over active thyroid (hyperthyroidism). If so, you’ll need to consult your Doctor before using Slim Weight Patches. The main benefit of Slim Diet Patches is the fact that the nutrients enter the body through the skin, directly into the bloodstream, which means up to 95% of them are absorbed. The problem with tablets is that our bodies are all different, our digestion is not always efficient and the amount of nutrients that actually make it into the bloodstream from the digestive system can vary enormously. You might only be able to absorb a fraction of the ingredients which is very wasteful and inefficient, but trans-dermal technology overcomes this. The makers of the Slim Weight Patch point out that this technology offers not only increased results, but better value for money too, as more of the nutrients are actually used by your body to fight fat. 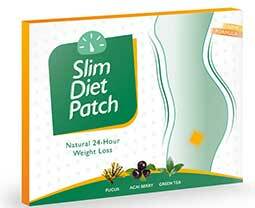 Slim Diet Patches contain a number of proven fat burning and weight loss aiding nutrients including Fucus Vesiculosus, 5-HTP, Guarana, YerbaMate and a fat burning RX blend consisting of Zinc Pyruvate, Flaxseed Oil, Lecithin, L-Carnitine and Zinc Citrate. The iodine in Fucus Vesiculosus has been shown to help maintain a healthy thyroid, which along with its other nutrients, could increase fat burning while exercising. While obese patients taking 5-HTP experienced significantly greater weight loss than a control group who were not taking the supplement, in a study published in the American Journal of Clinical Nutrition. The other ingredients are known to suppress appetite and boost fat burning, so they have certainly not held back with this formula. As with any supplement there is the chance of mild side effects, but sticking to the manufacturers guidelines will help avoid this. Also, as the nutrients are delivered to the body transdermally, there’s no chance of causing an upset stomach. Fucus Vesiculosus contains iodine which is partly responsible for its fat burning properties, so if you suffer from an over active thyroid (hyperthyroidism) you’ll need to consult your Doctor before using Slim Weight Patches as extra iodine can effect this. One of the main benefits of patches is they are perfect if you hate taking pills, as you literally just stick one on your skin each day. And they work 24 hours a day, 7 days a week, so no need to remember to take your pills 3 or 4 times per day. That’s definitely a benefit and makes them a little different. It also makes them very convenient and avoids the stomach upset of some weight loss pills. The ingredients themselves are well proven and help weight loss in multiple ways. Also, it makes sense that more of the nutrients will get to where they are needed in your body thanks to the trans dermal tech, so certainly worth a try and should prove to be excellent value for money. One months’ supply (30 patches) costs £37.00 but there are discounts for multiple boxes. Next day delivery is available and you are covered by their full money back guarantee. The dubiously titled Size Zero Patch claims to allow you to slim down to a ‘Size Zero’. Suggesting that the patch allows the wearer to drop a significant amount of weight very quickly. It tries to associate itself with the concept of “Size 0” – a women’s clothing size in the US catalog sizes system. The manufacturers say that the Size Zero diet patch releases a regulated amount of fat-burning ingredients over time that delivers ‘the best possible weight loss results’ that no other weight loss patch can provide. However, there is no evidence to support this claim. The claims the manufacturers make appear to be overhyped and untrue. Suggesting that the user could drop 24 pounds in 2 weeks is extremely unlikely and potentially dangerous. Not to mention such an extreme weight loss in a short space of time is not likely to stay off. The Size Zero Patch claims to contain natural, herbal ingredients although this is extremely vague as they do not list any of the ingredients on the website, in fact the ingredients in the patch are not disclosed anywhere. The Size Zero Patch is designed to be worn daily, replacing the patch every day for 6 consecutive days and then having a break on the 7th day to allow the body to recover. Which begs the question; if the product was in fact all natural why would the body need to recover? The website claims that there has been not one single negative testimonial or weight loss failure in their user study, a claim like that seems unlikely. And although they are showing an endorsement from a doctor, there is no evidence of any clinical studies or information to back up these claims. Even more worrying, there are no actual product shots of the patch. There have been numerous complaints from all aspects of Size 0 – here is one excerpt for a forum thread. Available to buy from the official website – not available in the likes of Boots, Superdrug or Holland and Barrett or anywhere it would seem in the UK high street. The Size Zero Patch can be ordered in packs containing 12, 24, 36 and 48 patches. You choose the packages depending on the amount of weight you wish to lose. For example; to lose 24 pounds, the manufacturers suggest you should order 12 patches. The starting price is £32.00 / $49.95 for 12 patches which is only just over 2 weeks worth of patches. Contrary to all it’s outlandish claims, the Size Zero Patch just does not stand up to its competitors. It’s claims are over hyped and unproven. 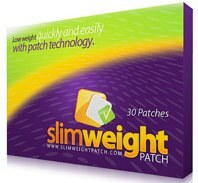 The Slim Weight Patch supplied by Slimming.com are both transparent and honest and supply evidence of clinical trials and medical backing. It has an excellent reputation as being one of the most effective weight loss patches available. Users can expect to lose a far more realistic 2-4 pounds a week. This is not only a healthier and more controlled way of losing weight, dieters will be able to maintain the steady weight loss. The Slim Weight Patch is designed to be worn 7 days a week, a full month’s supply (30) of patches is priced at just £29.95. Which is excellent value for money compared to The Size Zero Patch which provides only 12 patches for £49.95. 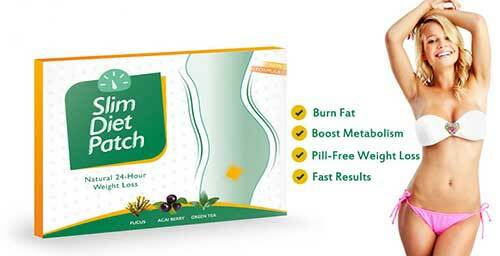 The Slim Weight Patch offers so much more for anyone wanting to lose weight.